Without doubt the final hymn of the Psalter can be described as the climax, or grand finale, of the Israelite faiths most known hymnbook. In this psalm, sound and action are blended into a picture of ecstatic joy. The whole universe is called upon to magnify Yah(weh), the God of Israel. The text poses various exegetical challenges. In the past, Psalm 150 was traditionally analysed as a single text; but with the advent of the canonical and redaction-historical approaches to the interpretation of the Book of Psalms, Psalm 150 can be interpreted as part of the final Hallel (Pss 146150), or Book V (Pss 107150) of the Psalter. This view opens up new possibilities for reading the psalm in broader contexts and its broader literary context(s) illuminate its theological significance. This article is an attempt at reflecting on the psalms context(s), structure, Gattung and dates of origin, tradition-historical relations to the Pentateuch, Psalms and other Old Testament texts. Ultimately some reflections on the psalms theological significance will be suggested. Careful reflection on the faith experiences described in the Psalter results in a diverse kaleidoscope of vastly different portrayals  at once so real, and yet sometimes so deterring. There are cries and tears of lament, anger and vengeance; prayers for relief; trust that creates hope; the exuberant joy of praise and thanksgiving; wise reflection and many more  all portrayals of faith experiences built around the acting and felt absence or presence of the Israelite God, Yahweh. Chaos, pain and destruction often threaten to dampen the existence and meaning of life. Praise and joy appear less often in the first part of the book. In Psalms 90-150 (Books IV-V) hymnic forms, hymns and hymnal pieces increase (Spieckermann 2003:142). Ultimately, these songs of praise cannot be suppressed and the different hymn collections (Pss 113-118; 135-136) culminate in the final Hallel (Pss 146-150)  the crescendo or fortissimo of the most famous Israelite hymnbook. Psalm 150 appears to be the grand finale of this crescendo. Its content and atmosphere portray a language of pure praise. Is this text a denial of the previously described pain, doubt, anger, disbelief, or experiences of hopelessness? Does the psalm offer a realistic faith experience for individuals and faith communities? Or is the ritual act of praise a blind tool to manipulate the divine power towards outcomes of deliverance, healing, upliftment of distress, bringing about hope, or other positive incentives? Psalm 150 poses various exegetical challenges. In the past the psalm was traditionally analysed as a single text; but with the advent of canonical and redactional-historical approaches to the interpretation of the psalms, Psalm 150 can be interpreted as part of the final Hallel (Pss 146-150), Book V (Pss 107-150), or the Psalter as a whole. This view opens up new possibilities for reading the psalm in multiple contexts. Not only the psalms possible historical context(s), but also its possible cultic and literary contexts could illuminate its theological significance. This article is an attempt at reflecting on the psalms context(s), structure, Gattung and date(s) of origin, tradition-historical relations to the Pentateuch, Psalms and other Old Testament texts. Ultimately some reflections on its theological significance will be suggested. As final text of the Hebrew Psalter, Psalm 150 forms an integral part of Book V (Pss 107-150). Several scholars have contributed to the contemplation on the composition and theological perspectives of Book V (Pss 107-150).1 But despite a variety of possibilities a few theological characteristics prevail. The books language, composition, theological trends and open-endedness outline its own characteristic profile. 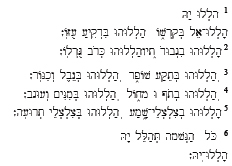 With the final doxology (Pss 146-150), the Egyptian Hallel (113-118), the hymnic twin psalms (111-112; 135-136) and numerous Hallelujah exclamations, Book V portrays a strong hymnic character (Koch 1998:251-258). The liturgical collections 113-118 and 120-134, bound by Psalm 119, underscore how the central part of Book V is liturgically orientated to the annual festivals Peah (113118), abūot (119) and Sūkkot (120-134). Hereby the salvation-historical stations of the Egyptian exodus, the Torah at Sinai and the arrival in Jerusalem at Zion are theologically commemorated. With an inclusion Book V is framed by hymnic praise and wisdom perspectives (107:42-43; 145:19-21): Yahwehs universal reign and providence for all creation are hailed. A challenge follows this praising of the gracious and loving Yahweh: the wise should react with insight to Yahweh and his deeds. The final Hallel (Pss 146-150) is a crescendo that perpetuates the theme of praising Yahweh - first by the individual (146), then the community (147) and ultimately the whole creation (Pss 148, 150; cf. Kratz 1996:26). In addition to the outside frame, an inside frame puts the emphasis on David (Pss 108-110; 111-112 and 138-144).2 This king David tends to be the persecuted servant3 of Yahweh, the universal king. This king David probably belongs to a re-interpretative category that reflects on Yahwehs people as his obedient servant, namely the (afflicted) individual, the community and the whole creation. In a concluding wisdom perspective this people of Yahweh is blessed (Pss 144:15). Without doubt the theology of Book V is embedded in a universal awareness. The Psalter consists of a literary and theological framework of larger and smaller collections of which individual psalms can be related and from where they could be interpreted. The redactional division of the whole into five books (Pss 1-41; 42-72; 7389; 90-106; 107-150) is well-known. This five-part division attributes a Pentateuch or Torah character to the Psalter, which is affirmed by the introitus Psalm 1 (Kraz 1996:13-28). From its overture the Book of Psalms can thus be read, sung, or meditated as Torah-obedience or Torah-worship. Prior to Books IV-V, Psalms 2-89 form the first three Books of the Psalter. Psalm 2 introduces the enthronement of Yahwehs earthly king and his royal function; whilst Psalm 89 describes the downfall of this Jerusalem king. From the rise to the fall of this earthly monarch, Books I-III theologically express the history of the different faith experiences of this Israelite epoch  stumbling between exuberant joy and grievous lament. When the earthly king fails, Yahwehs portrayal as king is accentuated. Therefore the theological trend of Books IV-V emphasises the kingship of Yahweh with its consequences for the Israelite faith. Psalm 150 is not untouched by, or disconnected from, the theological portrayals of these Books. Psalm 150 is the fifth and final psalm of the final Hallel. This doxology is not only bound by the inclusion framework - the Hallelujah calls in all five psalms - but on a redactional level as well the psalm as a whole forms the final or fifth doxology at the end of Book V (see Pss 41:14; 72:18-20; 89:53; 106:48; 150). This final collections summonses to praise Yahweh are therefore not only moulded into a five-part Torah character, but it conceptualises a Hermeneutics of Praise5 for the Book of Psalms as a whole. As literary composition these five Hallelujah psalms form a unit.6 Through the composition technique of concatenatio keywords (Stichworte) and motifs (Leitmotive) are utilised to effectuate mutual binding. These five psalms not only show a progressive dynamic, where every psalm is part of a logical sequence,7 but the collection similarly exhibits a concentric structure.8 These literary and thematic features underscore the artistic character and cohesion of the units composition. Thematically, hymnic and creation terminology form important building stones in this Hallels conceptualised Hermeneutics of Praise. Psalm 150 shares motifs, keywords, and themes with all five psalms from 145-149. Psalm 145 has a double function: it serves as final psalm of Book V (Pss 107-145), but also as a bridge between Book V and the final Hallel.9 Psalm 145:21b (let all his creatures praise his holy name for ever) resounds in 150:6 (let everything that has breath praise Yah) to emphasise the universal character of the praise to the king God, El, or Yah(weh). Reference to his mighty deeds (wyt_roWbg>) is found in 145:4, 11-12 and 150:2, whilst the motif of Gods greatness is described in 145:3 and 150:2. Psalms 146 and 150 are not only bound by the hymnic inclusion Hallelujah; the motives nephesh (146:1; life) and neshamah (150:6; breath) also form an inclusion that frames this collection. This inclusion indicates a progression from the individual life who praises God (Ps 146), to every living being in the universe who should praise him (Ps 150). In both Psalms 147:7 and 150:3 God is to be praised with the stringed instrument, the lyre (rAN*kiw). The notion of musical instruments in 149:9 (rAN kiw @t oB. lAx+mb.) concurs with the instruments in 150:3-4, namely the lyre (rAN*kiw), tambourine and dancing (lAx+mW @to b). Psalms 149:6 and 150:1a similarly share the reference to the divine name El. Resemblances and shared motifs in form and structure between Psalms 148 and 150 are also evident. Psalm 148 is even called the twin brother of Psalm 150 (Mathys 2000:339-343).10 Both psalms call for the universal praise of Yah(weh), although Psalm 148 has a more elaborate list of who should praise Yahweh from heaven and earth. Its extended lists of addressees (148:1-6, 7-12), as well as its focus on Israel (148:14), are more particular in its descriptions than the call to all living beings in the cosmos to praise Yah (150:6). Psalm 150 is therefore more allusive in its universal call for praise than Psalm 148; the psalm rather uses the short forms of the divine names (El and Yah) and tends to be a universal correction on the particularities of Psalm 148 (Mathys 2000:343). From its relationship to Book V (Pss 107-145) and the final Hallel (Pss 146-150), one may conclude that Psalm 150 was intentionally composed in view of its position as fifth psalm of the final Hallel.11 The presence of liturgical elements, cultic forms and musical instruments effect binding with the other psalms of the final Hallel. Its concise and summarising character allows for single psalms and other collections in the Psalter to identify with this text.  hymnische and liturgische Aufrufe (Seybold 1996:547-548). Crsemann (1969:80-81) has tried to resolve this problem through his depiction of the psalm as an imperative hymn (imperativischer Hymnus). According to his explanation the imperative form has lost its original function and has assumed a rhetorical form, which expresses the function to proclaim Gods praise. The Masoretic text of Psalm 150 is well preserved and transmitted. Only two minor text variants seem to qualify for text-critical consideration. In verse 2aβ a few Hebrew manuscripts and the Syrian Peshitta suggest that the text should read bro B. (for his...) instead of bro B. (according to his...).17 Also in verse 4aα a few Hebrew manuscripts add the preposition B. before the noun lAx+m to read lAx+mB.W (and with dancing) of and dancing. These text critical suggestions have been made to follow the structure of the psalm where parallelisms in verses 1b-5 exhibit the preposition B. after the imperative Hallelu or Halleluhu. Psalm 149:4 also renders a reading with the preposition lAx+mB. (with dancing). These suggested emendations have no significant impact on the theological interpretation of the psalm, and might only be applied for literary and artificial purposes. Argumentation for the alteration of the text therefore has no convincing firm grounds. 1 Praise the LORD (Yah). 2 Praise him for his mighty deeds; praise him according to his surpassing greatness. 5 praise him with the clash of cymbals; praise him with resounding cymbals. 6 Let everything that breathes praise the LORD (Yah). Praise the LORD (Yah). The literary composition of Psalm 150 displays an artistic and distinct structure. Its brevity is striking, even more so when considering its theological impact on the final Hallel, on the Psalter as a whole and on the theology of the Israelite faith. Yahweh, the Israelite God, is characteristically described with the depictions El and Yah. The psalm is framed by the imperative and the divine name (Hy" -Wll.h;(), Praise Yah (vv. 1a, 6b). This inclusion, which the psalm shares with Psalms 146-149, serves as the theological programme that builds the Psalters climax with an open call to universal praise. Verses 1b-6a are further characterised by the tenfold appearance of the imperative verb form Wll.h;( or WhWl l.h. In 6b the jussive of the verb ll.h is used. As object of praise the name of God, El, appears in the first hemi-stichon of verse 1b; where after reference to him is constantly made by means of the suffix third person singular. Except for verse 2b the imperative is always followed by the preposition B (9 times). The inner structure of verses 1b-6a is demarcated into three parts, namely 1b-2, 3-5 and 6. Verses 1b-2 are characterised by the appearance of parallelismus membrorum in every stichon; whilst verses 3-5 are stylistically bound by word pairs, repetition and sound imitation or onomatopoeia (v. 5). Rhyme (vv. 1b-2), alliteration of the a and  sounds (vv. 1b-2), assonance (s sound in verse 1; sl sound in verse 5; sm sound in verses 5-6) and merism (1b) are also figures of style used by the poet. Syntactically the imperatives followed by the preposition B. effectuate further cohesion in verses 3-5. In contrast to verses 1b-5, verse 6 introduces a reversed syntax. Instead of commencing with the expected Hebrew verb form the verse starts with the noun hm'v'N>h; lKo followed by the jussive form of ll.h (... This hemi-stichon expresses a final wish to praise Yah(weh). Psalm 150 is a summons to praise. It consists of a series of calls to praise the Israelite High-God, Yahweh, with means that exceed conventional boundaries. Like all psalms of the final Hallel, Psalm 150 is framed by the typical imperative Wll.h; and the divine name Hy (Praise Yah). The imperative of the verb ll.h appears 12 times. Theologically, these calls to praise Yah have a hymnic function: they proclaim Gods praise. The tenfold repetition of the imperative (vv. 1b-5) certainly has theological significance. Like in Old Testament enemy lists (Ps 83:6-8) or genealogies (Rt 4:18-22), the number ten expresses completeness.19 The number could also be seen as an allusion to the ten creation words of God (Gn 1), or to the ten words of the Decalogue (Ex 20:1-17; Dt 4:13; 5:6-21 and 10:4).20 The Torah character of the praise is hereby embedded in the psalm. Any hymnic response on the part of the cultic visitor (or meditative reader) to the summons for praise would therefore signify complete obedience to Yahweh. To praise Yahweh is thus a deed of complete Torah obedience. According to form and content, verses 1b-2 form a literary unit. Both verses, each consisting of two hemi-stichoi, are characterised by its parallelisms (pair- and end rhyme of the sound) and the imperative followed by the preposition B.21 These verses attempt to locate the El-gods praise, with the suggestion of where he should be praised (v. 1b). It further provides limited motivation on why Yah deserves praise (v. 2). Praise God (El) in his sanctuary; praise him in his mighty firmament. 2 Praise him for his mighty deeds; praise him according to his surpassing greatness. El should be praised in his sanctuary (Av+d>q'B ... in his temple) and in his mighty firmament (AZ*(u (:yqIr>Bi). In the context of cultic worship, the sanctuary denotes the earthly abode of Gods dwelling place, namely the Jerusalem or Zion temple, or even another sanctuary (Pss 60:8; 68:18; 108:6; Am 4:2 etc.). But, is this indeed what the text is alluding to? If his mighty firmament (v. 2aβ) is a synthetic parallelism of his sanctuary (v. 2aα), then only the heavenly or transcendent world is summoned to praise Yah (Ps 29:1; 148:1). This is clearly not the intension of verse 1a.23 If both descriptions in his sanctuary and in his mighty firmament are merisms24 to signify the earthly and heavenly abodes of Gods reign, then a more comprehensive world is summoned to praise El. The descriptions in verse 2aβ (in his mighty firmament) and verse 6 (let everything that breathes ...) transcend the intention of praising El in an earthly abode alone. Therefore both the spacial term sanctuary and the cosmological depiction firmament ((:yqIr>) in Psalm 150:1 are indefinite spatial descriptions26 which allude to the entirety of Gods reigning spheres. These terms include the categories of earthly and heavenly, immanent and transcendent, but also locality beyond these descriptions. Verse 2 declares why Yah should be praised. The two aspects of his kingship mentioned here are his mighty deeds (v. 2aα) and his surpassing greatness (v. 2aβ). Mighty deeds (Pss 106:2; 145:4, 11-12) is an indefinite and general description of Yahwehs creation and salvation deeds in the history of his people Israel.27 These mighty deeds28 are heroic, warlike deeds of deliverance through which he subdues chaotic and endangering powers of destruction. This conquering of chaotic powers confirms his infinite greatness and incomparable kingship. Therefore his surpassing greatness (v. 2bβ) gives expression to his superiority over the entire cosmos and history. This verse therefore describes both what El has done and who he is. Verses 3-5 catalogue the largest list of musical instruments in the whole of the Psalter.29 In view of the cultic summons to praise (vv. 1-6), the notion of the sanctuary (v. 1b) and other liturgical calls (vv. 3, 5), a first reading of the text leaves the impression of a festive liturgy for temple worship (Weiser 1962:841), where a combined temple orchestra is ready to perform its grand symphony. Second readings raise new thoughts on the ritual performance of a single combined orchestra. This literary unit addresses the manner in which God can be praised. Every hemi-stichon is introduced by the imperative form of ll.h with third person suffix followed by the preposition B... The preposition is followed by the object or musical instrument. Eight (or nine) instruments are mentioned which represent wind, string and percussion instruments. 3Praise him with the sounding of the sjofar; praise him with harp and lyre; 4praise him with tambourine and dancing; praise him with strings and flute, 5praise him with the clash of cymbals; praise him with resounding cymbals. Instruments are described in word pairs, with the exception of the first and last instruments  both sjofar (v. 3) and cymbals (v. 5) break the pattern of these word pairs. The sjofar appears alone, whilst the cymbals occur twice as cymbals of listening and cymbals of a loud blast. The question remains as to whether this repetition of the cymbals indicates different kinds of instruments30, or various functions31, executed by the cymbals. The sequence and function of the musical instruments in these verses requires reflection, especially to determine its theological significance. A first possibility allows for a combined temple orchestra as part of a temple worship service (Weiser 1962:841). In such a scenario the instruments function focuses on the comprehensive and all encompassing praise offered by voices and instruments. But the presence of profane or non-cultic instruments in the list casts doubt on such a cultic ritual act.  the laity who play the rest of the instruments (Gn 4:21; Job 21:12; Ex 15:20; Jdg 11:35; 1 Sm 18:6). A major objection against this hypothesis is that the use of the sjofar was not reserved for the priests alone and that the harp and lyre were not only played by the Levites.33 The arrangement of the instruments in verses 3-5 to fit these three mentioned categories is therefore not convincing. A suggestion to use spatiality and the structure of the Jerusalem temple to understand the arrangement of the instruments (and the theology of Psalm 150) offers a more convincing solution.34 The linguistic structure of the text reflects an analogy with the Zion temple building. The temple is the mythological centre of the universe and the symbolic sphere of Gods abode and reign. Relevant for this analogy is the innermost part of the temple, the court of the priests and the outside court for the lay people. A spatial movement from inside to outside35 and the wider expansion of cultic musical instruments across the boundaries into the spheres of the profane, characterise the nature of the theology of this part of the psalm. Not only cultic groups, but also social groups with their musical activities outside the cult, are summoned to praise God. These instruments performed various functions in- and outside the cult or temple worship. The sjofar was a signal instrument in cultic and military situations.44 It also had royal associations, as it was blown when the king or leader appeared (2 Sm 15:10; 1 Ki 1:34, 39, 41; 2 Ki 9:13). As the oldest and most used instrument in Old Testament times the sjofar was the horn of a ram or a wild bovine. From the innermost part of the temple the sjofar was blown as the signal to worshippers that God is appearing (theophany), or that they should bow down, shout in praise or pray. The harp and lyre were both stringed instruments. They often appear alone, but are sometimes mentioned together. They were used as musical accompaniment in the both the profane (Gn 4:21) and cultic spheres of life and supported the words of songs and choirs, especially hymns and thanksgiving songs (Pss 33:2; 57:9; 21:22; 81:3; 147:7; 149:3). Hereby they supported the praise of the divine. Both instruments differed in size and shape as well as in the number of strings.45 Either a plectrum of wood (or other material), or the fingers of the right hand, were used to play the strings (Oesterley 1939:591). According to the Chronistic History these stringed instruments belonged to the spheres of the Levitical professional musicians (1 Chr 15:16, 28; 16:5, 25:6; 2 Chr 9:11, 20, 28). Harp and lyre therefore belong to the adjacent part of the priestly court. Women were associated with the tambourine and dancing.46 The tambourine, or timbrel, was a hand drum struck rhythmically with the hand. It was used as the rhythm instrument when women performed ritual dancing in a circle (Jr 31:4; Ex 15:20; Is 30:32; Pss 81:3; 149:3) to celebrate victory or to express joy. This musical activity happened outside the spheres of the sanctuary and cult (Seidel 1981:95). Whether it became part of the temple musical activities during the Second Temple period remains uncertain (1 Chr 25:5; Ezr 2:65; Neh 7:67). The strings and flute were melody instruments. Strings (~yNI mi) appear as instrument or group of instruments in Psalm 45:9, whilst flute (bg)W()) occurs in Genesis 4:21, Job 21:12 and 30:31, most probably as wind instrument. The nature of both instruments remains unclear (Braun 2002:31). The bg)W( is usually interpreted as a flute or lute47, but because of its connection with kinnor (lyre; see Job 30:31 and 11QPs 151:2) it is also seen as a stringed instrument. These strings were probably not played by cultic musicians, whilst the flute also belonged to the profane sphere where wandering professional musicians performed music from place to place (Seidel 1981:95). Both the instruments and activities of women and folk musicians are associated with the spheres of the outer-court (or the non-cultic space outside the temple). Finally the cymbals resound in our musical list. Either two kinds of cymbals, or two different functions performed by them, are described in verse 5.48 The text denotes them as cymbals of hearing and cymbals of a loud blast. Both the repetition and sound imitation (onomatopoeia of yl ec.l.ciB) applied by the poet create the effect of accumulative festive joy.49 The crescendo has reached a climax. By producing loud sounds participants of a worship service mediate contact with God, whilst praising and singing under the accompaniment of cymbals and other instruments (2 Chr 5:11-14).50 It is important to note that cymbals were not clearly linked to the temple cult (2 Sm 6:5), as only the late texts of the Chronistic History indicate them as cultic instruments.51 They were nonetheless related to religious ritual and the people of Israel. From the preceding description it becomes evident that not all mentioned musical instruments (vv. 3-5) were linked to temple worship or cultic personnel. The poet therefore created an ideal and imaginative orchestra,52 a literary symbolic universe or cosmic cathedral, in analogy to the structure of the temple building. By following the temple structure in a movement from inside to outside and by using conventional musical instruments of the time, the poet alluded to worlds beyond instruments, spaces, people and categories  who are all called upon to respond in praise to God. It is further clear that music and musical instruments not only sufficed as support or extension of the human voice, but the noisy sounds produced by these instruments and cultic participants served as medium of contact between worshippers and the divine world.53 Loud sounds in the cult established contact between god and people. Beyond these functions the power of music evokes the aesthetic beauty of sound that creates pleasant feelings of joy and hope, which exceeds the power and function of words. 6 Let everything that breathes praise Yah. hm'v'N> (life or breath) alludes to Genesis 2:7, where God created human kind and blew the breath of life (Pr 20:27) into their nostrils. All human beings received this gift of vitality (Jos 10:40; Dt 20:16; Jos 11:11, 14; 1 Ki 15:29; Job 32:8; 33:4; Is 42:5). Life is not only reserved for human beings, but also given to birds and animals (Gn 7:22). All life originates from El as Creator. Verse 6 thus not only functions as a summons that all life returns this breath to the creator as a deed of praise, but the verse alludes to the dependence of all living creatures upon God. This wish, which alludes thematically to Psalm 145:21b, serves as the summarising conclusion of Psalm 148s extended list of living beings that are to praise Yah in heavens and on earth. It is important to reflect for a moment on the relationship of Psalm 150 to Psalm 1 and to the rest of the Psalter, in order to discover some nuances on the concept of praise. The canonical and redaction-historical approaches to reading the psalms require a comparison of these perspectives. Both Psalm 1 and 150 are corner psalms (Eckpsalmen); the one to introduce and the other to conclude the Psalter. In Psalm 1 the individual is addressed and the importance of the Torah is emphasised for the joyful and happy life in the community of Yahweh believers. Psalm 150 is a universal call on all that breathes to praise the same God vigorously. As fifth psalm of the final Hallel and of Book V, Psalm 150 extends ten imperative summonses for praise, a feature which attributes a Decalogue and Torah character to the psalm. Both psalms thus frame the Psalter with the theolegomenon of the Torah. Inevitably praise in Psalm 150 is coloured by this Torah character.54 In a life of faith, the Torah-obedience visualised in Psalm 1 is thus embedded in the execution of praising Yahweh (of Ps 150), whatever means this praise assumes.55 Praise in various forms is thus a way to concretise and realise Torah- obedience.56 This lyric includes obedience and is not transcending, superseding, or overcoming it. As summation and keystone (Schluβstein) of the Psalter Psalm 150 draws all the experiences of the Psalter together into the denominator of praise. When reaching Psalm 150, the believer (reader or meditator) is fully aware of the kaleidoscope of diverse faith experiences as described throughout the Psalter. The praise of Psalm 150 therefore cannot (and does not) obliterate pain, doubt, thoughts of vengeance, misfortune and failure.57 In other words, this praise is no cancellation of Psalms 2-149. This praise carries the scars of life. In the spirit of Paul Ricoeurs idea of a second navet this praise is only a return of the stumbling believers breath to its origins, Yahweh  the Israelite God of cosmos and history and incomparable creator of the universe. To determine the origin of Psalm 150 is no easy endeavour. Scholars should be hesitant to compromise themselves on a final word about the historical, cultic, or literary settings of Psalm 150. It is true that there are no adequate indications as to its time of origin (Eaton 2003:484). Suggestions to date the psalm vary and are sometimes vague and oblique.58 Possibilities vary from a pre-exilic59 to a post exilic period. Most scholars date the psalm in the post-exilic period60, more specifically around or after the Second Temple period61, because of the psalms position in the Psalter, the language in the text and the appearance (or absence) of some musical instruments. If the final redaction of the Psalter is to be dated between 300 and 250 this should give an indication of a setting to date Psalm 150. The psalm surely belongs to the final stages of the formation of Book V and the Psalter. An awareness of allusions to Genesis 1-2 (1:7-8; 2:7; 7:22), Ezekiel 1-3 and 10 (1:22, 25-26; 10:1) and Isaiah 6 (6:1-4) can certainly motivate a post-exilic setting for Psalm 150. The symbolism of the numbers 5 and 10 attributes a Torah character to the psalm. In addition to this, the Chronicler creates the awareness of how important a role music had played in the postexilic Yehud community. The importance of Torah and music is an indication to situate our psalm after Ezra, Nehemiah and Chronicles. Furthermore, the universal trend in the psalm, its indefinite descriptions, and its summarising character all play a decisive role in a choice for a Sitz im Leben after the time of the Chronicler. The Qumran text of the psalm (11QPsª) also supports the Masoretic text reading and its variants. This confirms the close distance between these texts. In view of these arguments I would like to suggest a date between 350-250 BCE for the dating of Psalm 150. During the history of music, Psalm 150 has sufficed as motivation for several musical compositions. Benjamin Britten, Igor Stravinski, Anton Bruckner and Cezar Franck are testimonies of how this grand finale of the Psalter inspired their works (Ravasi 1998:859). Psalm 150 unites all the voices of the Psalter by means of a series of summons to praise El, the Israelite God of cosmos and history. The psalm is therefore not to be read in isolation. As Schluβstein (keystone) of the whole Psalter it unifies all the diverse experiences of the Psalter in praise. The creator God of Israel is to be praised universally: in heaven and on earth, transcendently and immanently, inside and outside the temple and cult, in cosmos and in history. His surpassing greatness exceeds the concepts of space and time in human understanding. Through his mighty deeds he has shown himself in cosmos and history to be incomparable King-God. Music and musical instruments not only supply ways of praising God. It is a power that exceeds the praise offered by the singing or speaking or shouting or dancing. Music offers praise beyond words. In Psalm 150 the musical instruments do not only function as signals, accompaniment and support, rhythm and melody, or contact with the divine; they represent worlds and words beyond instruments, spaces, people and social categories. Everyone and everything that lives should praise God with whatever means: priests, cultic and non-cultic officials, men and women, individuals and communities, lay people and professionals, human beings and animals. The power of music evokes the aesthetic beauty of sound that creates pleasant feelings of joy and hope. This hope is realised through all the varied forms of praise. And this praise is not ignorant of the sorrow and pain, doubt and hardship, failure and misfortune, or other experiences described in all other 149 psalms. All encompassing praise reckons with these experiences on the spectrum between lament and hymn. Such praise revives life and is simultaneously an expression of a Torah embedded relationship with this God of the universe. St Augustine called Psalm 150 a Magnum opus hominis laudare Dominum (A great work of humanity to praise the Lord). This is a fitting description. Anyone searching for life could respond to this magnum opus. Hereby the vision of Psalm 1:2 for obtaining joy and life can be realised. To respond entails a wise deed. I dedicate this article to a friend and colleague, Andries van Aarde, for his friendship and contribution to the Biblical Sciences in South Africa. 1. Significant work has been done by Westermann (1961/62:278-284); Wilson (1984:337-352, 1985, 1992:129-142, 1993:72-82); Whybray (1996); Koch (1998:243-277); Kraz (1992:1-40, 1996:13-28); Zenger (1996:97116, 1998:1-58); Goulder (1998) and McFall (2000:223-256). 2. Zenger (1996:114) depicts this part of the frame as eskatologisch messianisch. 3. The affliction and distress of this servant David are reflected in Psalms 140-143. 4. Wilson (1985:227-228) describes Book V as an answer to the plea of the exiles to be gathered from the diaspora. The answer given is that deliverance and life thereafter are dependent on an attitude of dependence and trust in Yahweh alone. 5. See Zenger (1997:14-20) for a full discussion of Psalms 146-150 as Hermeneutik des Psalters. 6. Zenger (1997:15-16) enumerates these features. This unity is built by the inclusion frame of the Hallelujah calls; the hymnic character of every psalm; intensive keyword and motif repetition; the creation theology in all five psalms and focus on Israel (Pss 147-149); the inclusion of 146:1 and 150:6 nephesh and hanishamah. 7. This progression is especially seen in the notion of the addressees or subjects from who praise should go out (Zenger 1997:16). They are David (Ps 146); Jerusalem or Zion and Israel or Jacob (147); heavenly beings and cosmos or earth (Ps 148); community of Hasidim (Ps 149) and everything who has breath (Ps 150). Consecutive psalms also pursue themes of the previous psalm to build the theme out. This includes: Yahwehs eternal kingship at Zion (Pss 146:10/147:12); Yahwehs special treatment of his people Israel (Ps 147:19-20/148:14/149:5); Yahwehs all encompassing reign is praised from Zion (Ps 147:12), heaven (Ps 148:1), earth (Pss 148:7), temple as symbol of cosmos (Ps 150:1). 8. In the concentric structure there are resemblances shared by Psalms 146 and 150; Psalms 147 and 149 with Psalm 148 capturing the central focus (Zenger 1997:18). All five psalms share motives of a creation theology. Psalms 146 and 150 have allusions to Genesis 1 and use the verb hll for praise; Psalms 147 and 149 share the motives: Israel, Zion, anavim, rşh, mpt and different verbs for praise; Psalm 148 has allusions to Genesis 1-2, the motive Israel, and uses the verb hll for praise. Resemblances also exist between Psalms 148 and 150. 9. See Wilson (1993:72-82) and Zenger (1996:97, 101). 10. Because of their similarities the question is raised whether both psalms have the same author, or not (Mathys 2000:340). 11. See the viewpoints of Mathys (2000:343), Leuenberger (2004), and Zenger (2008). Seidel (1981:91) argues that the psalm was created as a pure literary text because of its Situationsabstrakte Kommunikationsgeschehen. The psalm has no historical Sitz im Leben or definite cultic situation. Sein Sitz im Leben ist die Literatur. This intentional composition of the psalm as closing doxology for the final Book or Hallel is opposed by other scholars (Allen 1983:323) because of the presence of liturgical forms, cultic elements, and notion of cultic musical instruments. Anderson (1972:955) states that it is uncertain that the psalm was composed as concluding doxology to the entire Psalter. Gerstenberger (2000:458) is convinced that the psalm was not meant as literary text to be read or meditated, because of the cultic and form elements employed in the text. 12. Allen (1983:324) infers that the series of summonses, without the corresponding ground for praise, gives an open-ended effect to the psalm. 13. Most exegetes classify the psalm as a hymn (see e.g. Schmid 1934:258; Deissler 1964:572; Anderson 1972:954; Van der Ploeg 1974:507; Kraus, 1978:1149; Gerstenberger 2001:460; Clifford 2003:318; Weber 2003:384). 14. The structure of the Old Testament hymn normally consists of a call to praise, followed by the particle ki, and the reasons for praise. Ultimately the hymn concludes with a final call to praise (see Gerstenberger 1988:17; Brueggemann 1995:192). 15. Schmid (1934:258) vaguely mentions the setting of a feast without any further specification. Dahood (1970:150) only notes that the psalm has been intended originally for liturgical use, without giving any further detail of such a use. Foher (1993:72) is slightly more specific, when he mentions the possibilities of the daily service or a festival in the post-exilic period after 500 BCE. 16. See Van der Ploeg (1974:507). Seidel (1989:166) infers that the psalm was probably composed as final text of the final Hallel, but not intentionally composed as doxological conclusion of Book V (Pss 107-150). 17. The Qumran text of the psalm (11?Psª) also supports the Masoretic reading of the text. 18. In the ancient Near East, especially in Egypt and Mesopotamia, hymns and cultic music plays an important role in worship (Falkenstein & Von Soden 1953:59-130, 235-260). 21. The second hemi-sti ch of verse 2 is an exception. Instead of the preposition B the text uses the preposition K..
22. Psalm 104 confirms Yahwehs greatness (Ps 104:1) because he is creator God (Ps 104:2) and the One who orders the water chaos (Ps 104:7-9). See Seybold (1996:547). 23. Against the opinions of Duhm (1922:484), Konig (1927:664), Delitzsch (1949:414), Dahood (1970:150), and Eaton (2003:485); who explain that the sanctuary refers primarily to Gods heavenly dwelling. Briggs & Briggs (1907:544) correctly notes that there is no reference in the psalm to heavenly beings or things. 24. Mare (2001:19) infers that the merism indicates die omvang en totaliteit van die lof wat aan God gebring moet word. 26. Seidel (1981:91) describes the verses content as unbestimmte Ortsbestimmungen. 27. Psalm 106 depicts these deeds, inter alia, as the delivering deeds in Egypt, at the Reed sea, in the Sinai desert, at mount Sinai, at Meribah, and at times when Israel became unfaithful to Yahweh. References to his mighty deeds in Deuteronomy 3:24 alludes to the land occupation, whilst his greatness is connected in Deuteronomy 5:24 to the giving of the Decalogue, and in 9:26 and 11:2 to the deliverance from Egyptian slavery and the Reed sea, or other dangers during the desert wandering. 28. See Psalms 20:7; 54:3; 65:7; 66:7; 71:16; 79:11; and 89:14. 29. Several short lists of musical instruments appear in Psalms 33:2; 43:4; 47:6; 49:5; 57:9; 68:26;71:22; 81:3; 92:4; 98:5-6; 108:3; 137:2; 144:9; 147:7 and 149:3. 32. Scholars who hold this opinion include Gunkel (1926:622-623), Herkenne (1936:458), Kissane (1954:336), Kirkpatrick (1957:832) and Leupold (1969:1007). 33. See Van der Ploeg (1974:508). 34. Hans Seidel (1981:97-100, 1989:166-167) has posed and developed this hypothesis. 35. See similar structures in Isa 6:1-4; Jeremiah 17:12 and Psalm 93 (Hartenstein 1997:45, 2007:119). 36. The shofar appears in Exodus 19:16, 19; 20:18; Joshua 6:4, 5, 6, 8, 9, 13, 16 20; Judges 3:27; 6:34; 7:8, 16, 18, 19, 20, 22; 1 Samuel 13:3; 2 Samuel 2:28; 6:15; 15:10; 18:16; 20:1, 22; 1 Kings 1:34, 39, 41; 2 Kings 9:13; Isaiah 18:3; 27:13; 58:1; Jeremiah 4:5, 19, 21; 6:1, 17; 42:14; 51:27; Ezekiel 33:3, 4, 5, 6; Hosea 5:8; 8:1; Joel 2:1, 15; Amos 2:2, 3:6; Zephaniah 1:16; Zachariah 9:14; Psalms 47:6; 81:4; 98:6; 150:3; Job 39:24, 25; Nehemiah 4:12, 14; 1 Chronicles 15:28; 2 Chronicles 15:14. 37. The harp appears in 1 Samuel 10:5; 2 Samuel 6:5; 1 Kings 10:12; Isaiah 5:12; 14:11; Amos 5:23; 6:5; Psalms 33:2; 57:9; 71:22; 81:3; 92:4; 108:3; 144:9; 150:3; Nehemiah 12:27; 1 Chronicles 13:8; 15:16, 20, 28; 16:5; 25:1, 6; 2 Chronicles 5:12; 9:11; 20:28; 29:25. 38. The lyre appears in Genesis 4:21; 31:27; 1 Samuel 10:5; 16:16, 23; 2 Samuel 6:5; 1 Kings 10:12; Isaiah 5:12; 16:11; 23:16; 24:8; 30:32; Ezekiel 26:13; Psalms 33:2; 43:4; 49:5; 57:9; 71:22; 81:3; 92:4; 98:5; 108:3; 137:2; 147:7; 149:3; 150:3; Job 21:12; 30:31; Nehemiah 12;27; 1 Chronicles 13:8; 15:16, 21; 15:28; 16:5; 25:1, 3, 6; 2 Chronicles 5:12; 9:11; 20:28; 29:25. 39. The tambourine appears in Genesis 31:27; Exodus 15:20; Judges 11:34; 1 Samuel 10:5; 18:6; 2 Samuel 6:5; Isaiah 5:12; 24:8; 30:32; Jeremiah 31:4; Psalms 81:3; 149:3; 150:4; Job 21:12; 1 Chronicles 13:8. 40. Dancing appears in Jeremiah 31:4, 13; Psalms 30:12; 149:3; 150:4; Lamentations 5:15. 41. Stringed instruments appear in Psalms 45:9; and 150:4. 42. The flute appears in Genesis 4:21; Psalms 150:4; 151 (11Q); Job 21:12; 30:31. 43. Cymbals appear in 2 Samuel 6:5; Psalm 150:5. 44. The shofar was blown as signal of an alarm or an attack, as warning of danger, to call warriors together, during the temple worship to signal a theophany, or when people should bow down, shout, or praise. It also announced festive occasions like New Moon, Full Moon, and New Year festivals; or when the Ark was transported to Jerusalem (2 Sm 6:15). 45. The harp was probably larger than the lyre (Sachs 1940:115-117) and had between three and ten strings (Oesterley 1939:591). The lyre had between four and eight strings (Clifford 2003:320). 46. Braun (2002:30) describes how the instrument has female and sexual symbolism and was popular in fertility rites. 47. The flute is described as an elegant instrument (Keel 1997:344) mostly used in secular activities (Anderson 1972:956). 48. Cymbals appear widely in the ancient Near East and are archaeologically well attested (Clifford 2003:320). This instrument developed over a period of time (Oesterley 1939:593). A smaller pair of cymbals might have been held vertically and struck from above and below; another type, a larger set, might have been clashed horizontally (Werner 1962:470). Different types were probably made from different material or metal (Sendrey & Norton 1964:130). 49. The term h('Wrt. is related to the cult and signify the outbreak of festive joy (Pss 42:5; 27:6; 89:16; Am 5:23), an extraordinary loud sound (Ex 32:17; Lm 2:7), which resounds far and wide (Ezr 3:13; Neh 12:43). 51. In the Chronistic History they are described as ~yIT;l.cim. (1 Chr 15:18; 16:5; 25:6; 2 Chr 5:12; 29:25; Ezr 3:10). 52. Mathys (2000:333-339) refers to an imaginären, idealen Gottesdienstes. 54. The same characteristic applies for praise in the final Hallel and in Book V.
55. Brueggemann (1991:63-92, 1995:194) describes a dialectical relationship between Psalms 1 and 150. In shaping a life of faith the Psalter sets the parameters of obedience (Ps 1) and praise (Ps 150) for the believer. Ultimately, according to Brueggemann, obedience has been overcome, transcended, and superseded in the unfettered yielding of psalm 150. He reckons that by Psalm 150 all the rigors obedience have all been put behind the praising community (Brueggemann 1995:195). 56. I hereby disagree with Brueggemann (1984:167) who describes Psalm 150 as the outcome of such a life under torah. Praise and adoration is not an outcome but a means, a way to concretise Torah in life. Brueggemanns notion that the Old Testament thus finally expects not obedience, but adoration is to my mind untanable. It is not an either or. Obedience is embedded in praise and adoration. 58. Kraus (1978:1149) notes that the psalm is wohl in späte Zeit anzusetzen. What this late time period means, is uncertain. Because it is the final psalm of the Psalter Gunkel (1926:623) attributes it to the allerletzte Zeit der Psalmendichtung in the post-exilic period. Van der Ploeg (1974:508) is convinced that the text was de laatste van allemaal in the 3rd BCE, because the text is fully preserved in 11QPsa with all its text variants. 59. Goldingay (2008:747) is a sole voice in dating the psalm pre-exilic. His motivation is the notion that the rams horn (instead of metal trumpet of the Chronicles), as well as the word for cymbals (ylec.l.c as used in 2 Sm 6:5) instead of the Chroniclers ~yIT;l.cim. (1 Chr 15:18; 16:5; 25:6; 2 Chr 5:12; 29:25; Ezr 3:10) is used in the psalm. The psalm was then later added to the final group of psalms, which were mostly postexilic. 61. Clifford (2003:319) uses the universal tendencies in the psalm, the poets insight into Psalm 2 and the psalms position as conclusion Psalter as reasons to opt for a dating in the Second Temple period. 62. Gerstenberger (2001:460) sets this possibility and notes that the setting was not a scribal or school office, but the assemblies of the faithful as place of liturgical activities. 63. This stance is taken by Seidel (1981:99, 1989:167), who provides the following motivations: the influence of Ezekiel on the psalm; the metal trumpet has not replaced the horn as signal instrument; Nehemiahs time offers a situation of rebuilding Jerusalem and the community. It is a time when poets and musicians claim a fresh role in the cult and society. 64. Terrien (2003:930) describes this period as a time of hope. It was a time when the rebuilding of Jerusalem, Judah and former exiles continues. 65. Allen (1983:323) uses the absence of the instruments in 150:4b as reason why the psalm should be dated after the composition of Chronicles. This argument seems to be an argumentum e silentio. 66. Oesterley (1939:588) mentions several musical instruments, which occur in the book of Daniel, but lack in Psalm 150. His conclusion is that the psalm was therefore composed prior to Daniel. Again, this argument tends to be an argumentio e silencio.